The imitation/knockoff market never ceases to amaze me. This bladeless fan from Abiko is a knockoff version of the Dyson Air Multiplier. But unlike typical cheap imitations, Abiko's version, at $223, is almost as expensive as the real thing. 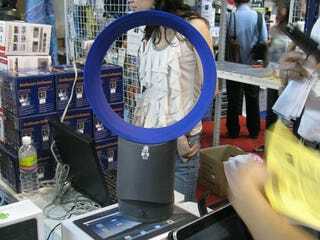 The Abiko version was spotted at Comex 2010 and by all accounts, works just as well as the Dyson Air Multiplier. In fact, the Abiko bladeless fan even has the same buttons and turns and tilts the same way as the Dyson. Good job on Abiko for knowing how to copy (er, steal) product design, I guess.